Hello, La Dolce Vita readers! It is Erin from Fig + Cotton again with some effortless entertaining tips. With the summer months upon us, I know many of you will be hosting friends and family for holiday weekends and last-minute sleepovers. Some folks are natural hostesses, but for some of us, overnight guests can lead to a bit of anxiety. Below are some tried and true tips to keep your most treasured guests comfortable and happy, while leaving you relaxed and able to enjoy your weekend too! 1. The bed. Freshly cleaned (and even ironed, if you are ambitious) sheets are a must. There is something so wonderful about climbing into crisp sheets when away or at home. Also, make sure there are extra pillows and blankets close by so your guests don't feel like they need to come calling in the middle of the night. Throw a light blanket at the foot of the bed or on a chair in the room for easy access if the night turns chilly. 2. Lighting. Make sure there is adequate reading light on at least one side of the bed, both sides for bonus points. In addition, many guests will want to sleep in (hey, they are on vacay, right? ), so think about ways to give them more freedom with how much light they want coming in the bedroom windows in the morning. If you have blinds or shutters, that will do just fine. If not, think about adding in some curtains before their arrival. 3. Their stuff. Whether it is a few clean drawers in the wardrobe, a free section of the closet, or even just a luggage stand, your guests need a place -- other than the floor -- to place their belongings. They will appreciate it. 4. Comforts of home. Keeping a well-stocked welcome basket in their room can truly be a life saver for your overnight guests. For tips and suggestions, see below! 5. Flowers. Always, flowers on the bedside table. Always. 6. Linens. Again, freshly cleaned, fluffy bath towels are a must. Make sure that the towels, wash cloths, and extra hand towels are in plain view so your guests know where to find what they need. 7. Toiletries. Provide an array of toiletries such as shampoo, conditioners, body wash, a fresh bar of soap, toothpaste, etc. in the guest bath. I know I usually forget SOMETHING when I travel, and it is always a welcome surprise when what I need is right in front of me. 8. Don't overbook, but do make a plan. Find out what your guests already have planned for their visit or what they are looking forward to enjoying where you live, and plan a few outings accordingly. Flexibility is key, but having a tentative plan certainly helps the weekend flow. If your guests are staying for multiple days/nights, providing them some alone time with some activity suggestions could be very welcomed. 9. Meals. Let you guests know ahead of time when and where the weekend meals will be. This will help plan their day, and get them excited for the cuisine du jour. For a fun way to communicate this to your guests, post the day's meals in the kitchen on a chalk board or even just on the fridge. 10. Have plenty of snacks and food choices available. In between meals, your guests may want to nibble or have a drink. Make sure you have easily accessible snacks and libations on hand so your guests can help themselves. 11. Don't forget about the kids. Even if you don't have little ones running around your casa, a quick trip to Target for a few age-appropriate games or movies will do wonders for your pint-sized guests. In addition, you may want to ask around for babysitting recs, in case you are planning a night on the town. 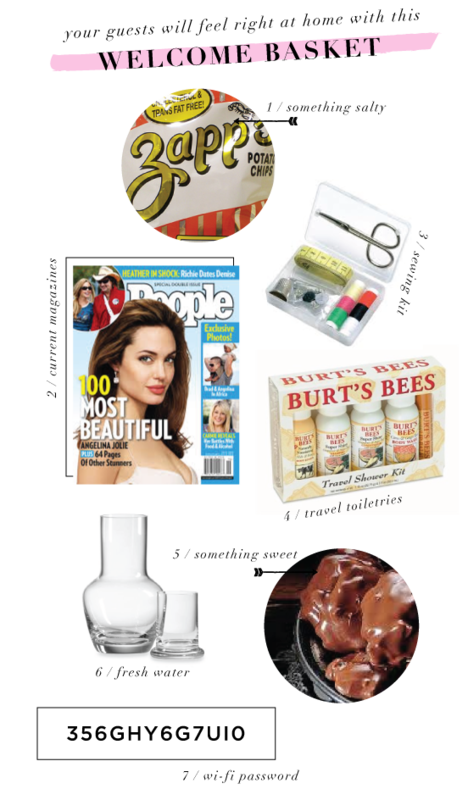 Here are my top picks for a no-fuss welcome basket sure to please your pickiest guest. 6 / bedside water carafe // 7 / yes, the wi-fi. probably the most important. These are awesome tips -- I love the idea of leaving them the wifi password! My guests are always asking about that! Awesome tips and I love the basket! It's such a thoughtful gesture. Will keep it in mind.